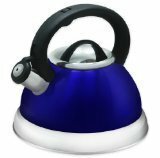 Color blue 18/10 stainless steel whistling teakettle. 2.8-litre capacity. 5milimeter encasulated aluminum base. Stay cool easy grip handle. Beautiful blue finish. Color green 18/8 stainless steel whistling teakettle. 2.8-litre capacity. 5milimeter encasulated aluminum base. Stay cool easy grip handle. Beautiful green finish. Color red 18/10 stainless steel whistling teakettle. 2.8-litre capacity. 5milimeter encasulated aluminum base. Stay cool easy grip handle. Beautiful red finish. 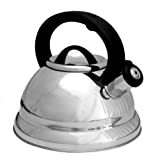 "This heavy duty tea kettle is a must have for any kitchen. * The blue color is vibrant and will brighten up any kitchen. 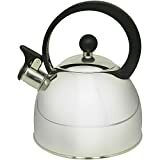 * The kettle is also available in red, green and silver. * The colors are rich and the look is very attractive. * It has a 2.8 Liter capacity and a Bakelite easy-grip handle. 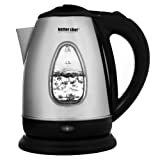 * It also includes an encapsulated base to allow for quicker heating - which is a fantastic feature for tea kettles"
Stainless Steel cordless electric kettle. Boils faster than a microwave oven. Particle filter. Boil sensor keeps kettle from boiling dry. See-thru water window. Locking lid for safety. 1.8 LITER, 7 CUP CAPACITY. Measuring marks on see-thru window. ETL listed.